Villa Martinho sits in an elevated, prime position close to the heart of Funchal, Madeira's capital city. This newly-built holiday home offers all the comfort and convenience you could need. Villa Martinho sits in an elevated, prime position close to the heart of Funchal, Madeira's capital city. This newly-built holiday home offers all the comfort and convenience you could need, along with outside space to enjoy. Amenities are attractions are all within a short drive of the villa. Every space inside Villa Martinho is relaxed and suited to the need of families. The neutral colour scheme with pops of bright colour adds a sense of fun and personality, with soft furnishings creating a cosy atmosphere. The main living space is open-plan and features areas for both unwinding and dining. The lounge features a comfortable sofa and flat screen television with DVD player for getting together and enjoying movie night. Large patio doors open straight onto the terrace. Sharing the living space is a dining table that can seat up to six people. The modern kitchen is fully-equipped and a range of convenient amenities are available, including a dishwasher, oven and fridge freezer. There's also a small table with chairs for those leisurely breakfasts when you're not in a hurry to head out for the day. Upstairs is where you'll find the three bedrooms, with all being of a good size and tastefully furnished. The master bedroom features a king-size bed, ensuite bathroom, balcony and fantastic sea views. Another bedroom also has a king-size bed, with the third bedroom featuring two single beds. There's a lovely family bathroom for use by all guests. Outside on the terrace is a large, private swimming pool, with sun loungers close by for soaking up the peaceful atmosphere. You can enjoy al fresco meals at the dining area with a table and charming built-in barbecue. The garden is walled, giving you both peace and privacy. It's the perfect place to relax and unwind with pre-dinner drinks or spend lazy afternoons by the pool. Guests will have easy access to restaurants, bars, cafes, shops, banks, pharmacies, car hire, supermarkets, gardens, and the largest public Lido. At the same time you and your guests will experience peace & quiet, as the villa located on a side street. 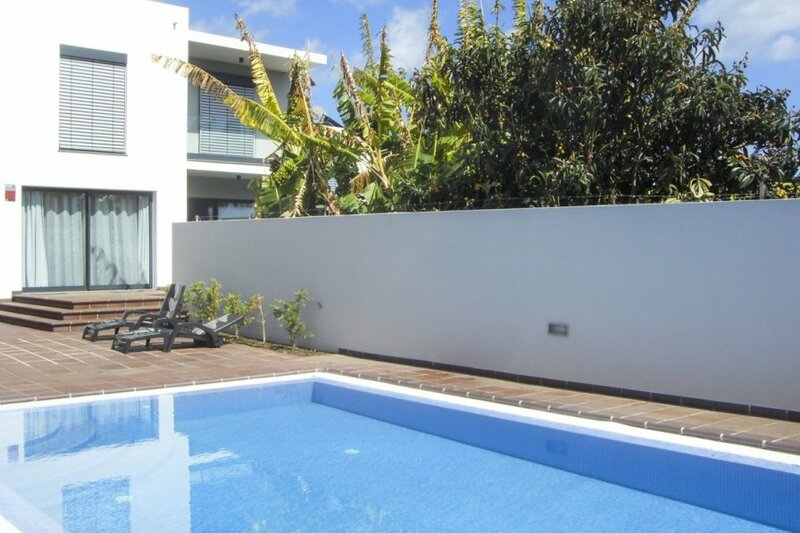 Villa Martinho is 3-bedroom villa that has a private swimming pool and excellent outdoor facilities. With several amenities close by too, you might have found an island gem! As the villa is part of a small neighbourhood and centrally located, convenient amenities are very easy to reach. Restaurants, cafes, bars, a supermarket and even a bakery are all within a five-minute drive. Forum Madeira Shopping Centre is also just five minutes away by car and is where you'll find a great range of shops and leisure facilities. Make sure you visit the rooftop garden for stunning views over the sea and the main plaza where plenty of activities for children are on offer. Just a short drive away are the main attractions of this area of Funchal. These include the marina, a waterfront area full of lively atmosphere and restaurants. You can also enjoy some dolphin watching by going on a catamaran trip from here. Despite there not being any golden-sand beaches in the area, there are several Lido's that give you access to black sand and volcanic-rock stretches. The old town area of Funchal is full of charm and history, which you can feel as you stroll along its narrow, cobbled streets. It's referred to as Zona Velha by locals and is known for its beautiful old buildings and churches. One of the most impressive is the 15th-century Corpo Santo Chapel. Enjoy a cable car ride from Funchal old town up to the Monte area, with its lovely botanical garden to explore.